This versatile stainless steel water-bath warmer/cooker features individual thermostats and power switches for each well. Adjustable thermostats, sense food temperature and turn each heating element on or off as needed eliminating burning or scorching. And the exclusive hinged lids return moisture to the food to retain your original flavor and consistancy. Includes the (3) 4 quart (3.8 L) insets with hinged lids as shown. Our soup kettles are the only ones in the undustry with actual degrees calibrated thermostats. They are NSF approved for "rethermalization" which means they can safely take even a frozen block of soup up to a safe serving / holding temperature quick enough ot be safe in regard to bacteria growth. This is important to a small concession stand or deli because they often do not have other large cooking equipment to work with. That make Server kettles the recommended brand for almost all the major soup manufacturers in the US. Adjustable, precalibrated thermostats for accurate heat control. (3) exclusive 4 qt (3.8 L) insets & lids. Hinged lid stays upright during ladling for easy customer use. Water fill line eliminates overflow accidents. 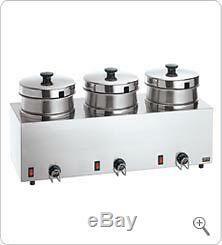 The item "Server Triple FS-4 85900 Food Warmer with4 Qt insets" is in sale since Wednesday, July 15, 2009. This item is in the category "Business & Industrial\Restaurant & Catering\Commercial Kitchen Equipment\Cooking & Warming Equipment\Soup & Steam Kettles". The seller is "concessionobsession" and is located in Richfield, Wisconsin. This item can be shipped worldwide.